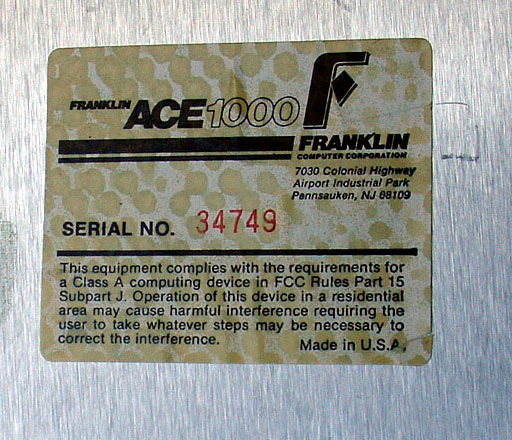 The Franklin ACE 1000 for a time competed with the Apple IIe and other offerings. This machine had the dubious distinction of being much larger and heavier than any Apple II and having the famous "reset" button right under the left hand side of the keyboard, where it could be (in)conveniently pressed, causing the loss of all programs and data not saved to floppy disk. Needless to say the Frankline ACE 1000 did not last long in the marketplace. Know more about the ACE? Contact us!